On October 25, 1812, the USS "United States", commanded by Captain Stephen Decatur, defeated the HMS "Macedonian" off of the coast of Africa. Five hundred miles south of the Azores, crewmen of the "United States" saw a sail 12 miles away. Capt. Decatur identified the ship as the HMS Macedonia and cleared his ship for action. Capt. Decatur intended to engage the Macedonian from a long range, where his 24-pounders would have the advantage over the 18 pounders of the British, and then move in for the attack. The battle commenced according to Capt. Decatur's plan. The USS United States fired an inaccurate broadside at Macedonian. The British retaliated by bringing down a small spar of the USS United States. 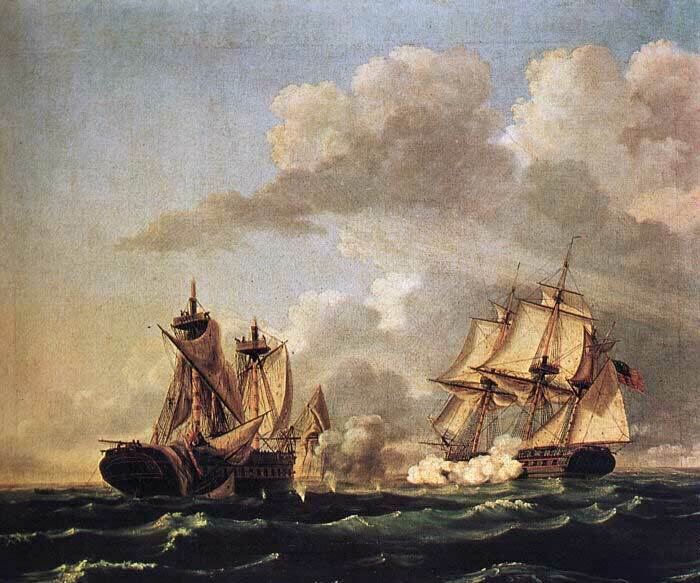 Decatur's next broadside attack destroyed the Macedonian's topmast thereby giving the United States the advantage. By noon, the Macedonian surrendered. There were 104 casualties compared to the United States' 2. The ships returned to New York Harbor on December 4 amidst tumultuous national jubilation over the spectacular victory. Capt. Decatur and his crew received special praise from both Congress and President James Madison. The Macedonian was subsequently purchased and repaired by the Navy and has had a long and honorable career under the American flag.